If you want to see an action star age gracefully, you could do a lot worse than "Police Story: Lockdown," an uneven but satisfying hostage crisis thriller that is also a perfect example of the type of late-period films martial arts star Jackie Chan has decided to make after entering middle age. Now 61 years old, Chan is simply too old to chase his youth by sustaining numerous life-threatening injuries while making consecutive roles (see my primer on the "Police Story" films for some more). Chan's recent films are fearless since they do something most Western movie idols either don't know, or don't care to do: make an age-appropriate action film. Chan plays Commander Zhong, an exhausted police officer who gets lured into an elaborate trap set by shady night-club owner Wu Jiang (Ye Liu). Zhong doesn't recognize Jiang, but is assured that they've met before. In fact, all of Jiang's other hostages have ties to him, though none can recall who he is. Zhong and his fellow captives--including daughter Miao Miao (Tian Jiang)--must nevertheless figure out how they're connected after Jiang kidnaps them, and uses them as leverage with the HK police to arrange the release of a long-incarcerated prisoner. Zhong's dilemma is, for starters, not particularly action-packed. He's stuck in dialogue for the most part, though there are a couple of decent fight scenes. During these scenes, we see Chan acting his age. One especially memorable action set piece shows Zhong getting pummeled by a huge, not-particularly-athletic type while fellow hostages beg him to be careful. Chan is not a pushover in this scene: he fights like James Brown sings, and therefore even looks good when taking a beating. Ultimately, Jackie Chan is still Jackie Chan, and the fight is won based on sheer bull-headed perseverance. 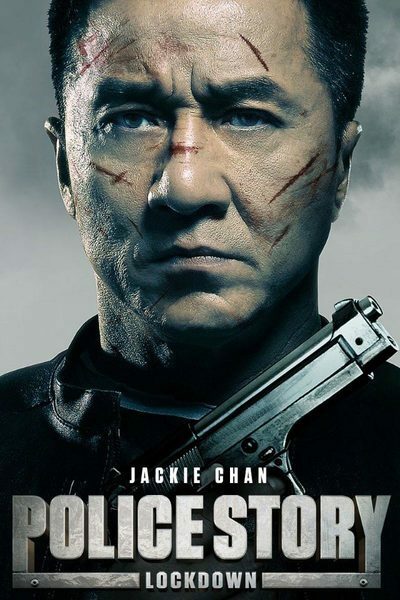 Therein lies the biggest reason to see "Police Story: Lockdown:" Zhong is a role that only Jackie Chan could play. It's a role that compliments various aspects of Chan's personality, both on-screen and off. Zhong's fighting style is more like brawling than balletic, choreographed fighting. This was also true of Kevin Chan, the superhuman, crime-busting protagonist Chan played in the first four "Police Story" films. Zhong is also an unsentimental cop whose idealism and civic duty leads him to irrational actions that no one but a legit superhero would think to do. In one flashback, Zhong tries and fails to recall where he knows Jiang from. He remembers a high-speed car chase that forced him to leave a small child behind so he could pursue a criminal alone. Writer/director Ding Sheng goes out of his way to show that the child wouldn't be stranded for long: two squad cars can be seen approaching. But you can see why Chan has such respect for the police based on that seemingly callous, but actually thought kind of snap judgment. Sheng ("Little Big Soldier," one of Chan's best recent vehicles) similarly takes time to show how competent and well-trained the police unit that tries to rescue Zhong is. These square-jawed characterizations are what make a Jackie Chan film unique. To be fair, "Police Story: Lockdown" is notably under-developed in parts. The film's drama is rather jerky, and its finale relies too much on expository dialogue, and a canned confrontation. But even the film's bombastic showdown is endearing: who else but old man Jackie Chan would start and end his film by pointing a gun at his head? "Lockdown" is the action film equivalent of a memento mori, a movie that reminds viewers of Chan's mortality. It is, in that sense, similar to "Chinese Zodiac," another recent Chan vehicle that essentially told fans "Listen, guys, there are some things I just can't do any more." Chan performed so many jobs behind the camera while making "Chinese Zodiac" (including action choreography and catering) that he broke a Guinness World Record. So while "Police Story: Lockdown" isn't even close to one of Chan's best films, Chan's pragmatic positivity is undeniably infectious. Here's hoping Sylvester Stallone and Arnold Schwarzenegger see and take notes while watching Chan prove yet again why he's the hardest working action star in show business.